When Crew needed photos for a project, they hired a local photographer. They didn’t like what they saw for stock photography and wanted something original. They ended up only using one of the images. Instead of having the images sitting in a folder and never getting used, they bought a Tumblr theme and launched on HackerNews saying, “do whatever you want with these, they are free”. They went to the #1 spot that day. Unsplash is a great example of launching a lean product that is entirely lovable from the start. Unsplash could have easily overbuilt the project. Instead, they used Tumblr because the goal was to share, not build a community. Tumblr comes pre-built with a community. Today Unsplash has grown from a simple Tumblr site to an industry-leading photography community. Photographers have seen their work used from award-winning authors like Deepak Chopra to tech giants like Apple. What started as a simple promise of 10 free photos every 10 days turned into a site that has over a billion photo views each month with 4 photos being downloaded every second. They eventually moved off Tumblr and started building their own app. As it became clear that the user experience could be improved with feeds, Unsplash turn to Stream, to enable their vibrant community to become more connected and engaging. With their explosive growth, they have stayed true to the Creative Commons Zero license. Every photo that a photographer adds to Unsplash is a gift to the world. It can be used by anyone and is free to copy, modify and distribute. Unsplash launched version 5 of their product on January 31, 2017. With it came notifications, following and aggregation; all built on top of Stream. 1.000.000+ views, of which 377.000 are gathered in the last month, 8700 downloads and 570 likes. To give you some perspective; I have posted 16 photos on Instagram in the past month, which only provided me with 11.188 views. This is especially striking when you consider that I have about 900 followers on Instagram, compared to about 30 followers on Unsplash. Unsplash was able to build the kind of feed experience that significantly impacted engagement on the photos. It is a big win for the users. That is what their team does best: solve user problems - not technology problems. The Unsplash feed really helps photographs go viral. When you upload, all your followers are notified and you can watch the likes and shares happen in a natural and organic manner. There is a home feed, a following feed and a new feed that contains fresh images by chronological order. The scale and complexity of feeds is handled by Stream. Stream easily handles the active user base that generates tens of millions of requests and activities that propagate to 50+ feeds. 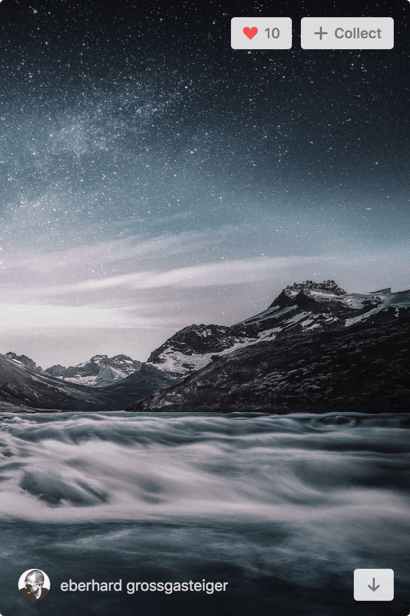 If you’ve spent any time on Unsplash, you’ll agree that they crafted a beautiful experience with the Stream API. They’ve done this with a simple integration that helped them launch fast. Compared to in-house solutions, Stream makes feeds trivial to engineer. Soon Unsplash will roll out impressive improvements to their feed experience by expanding their use of the Stream API. As more photographers contribute to Unsplash, discovering the perfect photo will be more challenging. Unsplash will use Stream Personalization to help give photos exposure that would otherwise never be seen. Our data science team will help tailor the machine learning exactly to their use cases. Discovery will be improved through adding topic based feeds, more advanced aggregation and broadening the notification system. As the product evolves, the Stream API is a foundation that can be depended on to scale, transform and enhance feed user experiences.